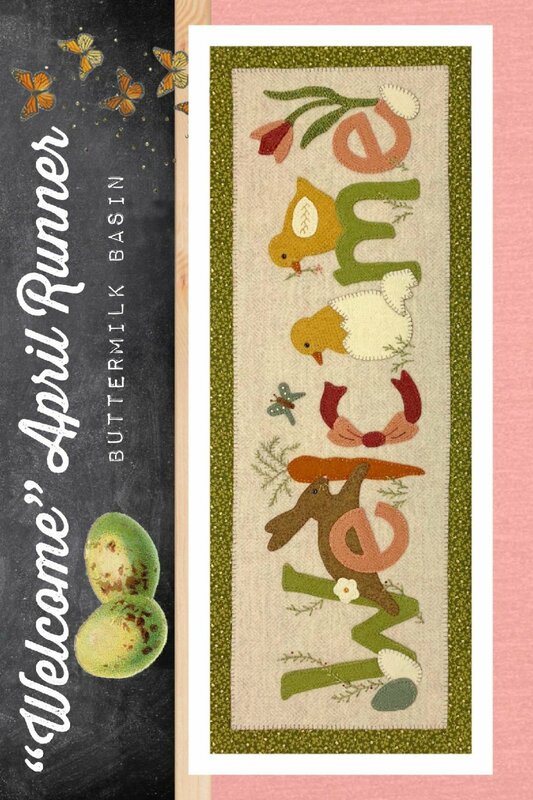 This fun Welcome mat for April is spring themed with chicks, a bunny and flowers! The wool applique on fabric mat is 9.5 x 26.5 inches when finished. The kit includes the pattern, wool and fabric. This fun Welcome mat for April is spring themed with chicks, a bunny and flowers! The wool applique on fabric mat is 9.5 x 26.5 inches when finished. This is for the pattern. Here is another in Buttermilk Basin's series of "Welcome" mats. The fun winter scene spelling welcome is perfect all winter long in your home. The kit contains the pattern, wool and fabric for this project. 9.5 x 26.5. This is the button pack that contains all of the hand dyed buttons we used on the "Welcome" January runner. Here is another in Buttermilk Basin's series of "Welcome" mats. The fun winter scene spelling welcome is perfect all winter long in your home. This is for the pattern only. 9.5 x 26.5. 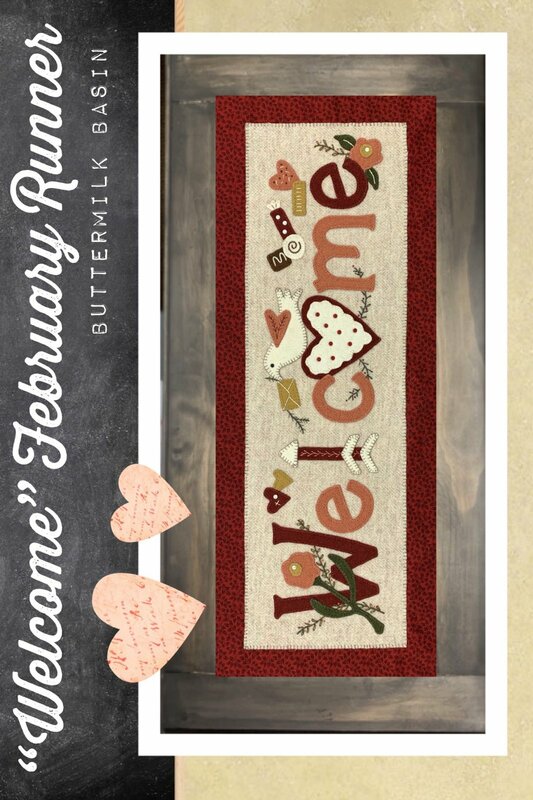 This fun Welcome mat is heart themed for February, perfect for February, or any time of the year if you love hearts! The wool applique on fabric mat is 9.5 x 26.5 inches when finished. The kit includes the pattern, wool and fabric. 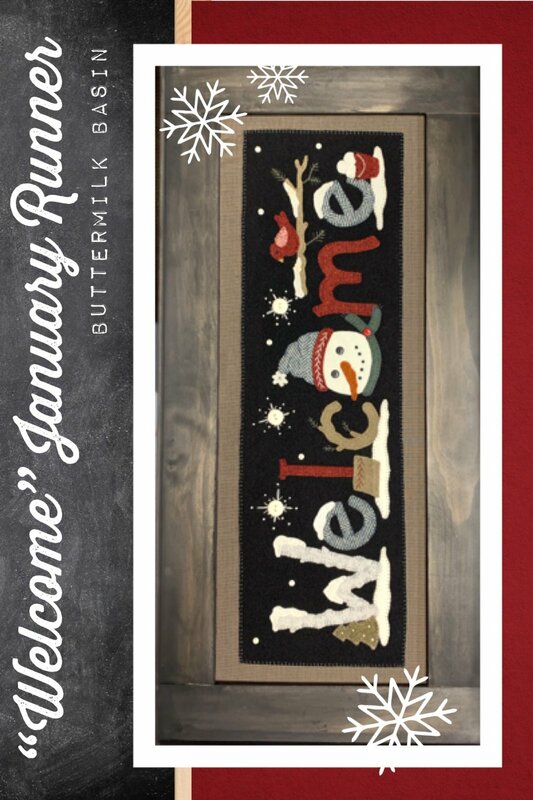 This is the button pack to make the Welcome February runner. 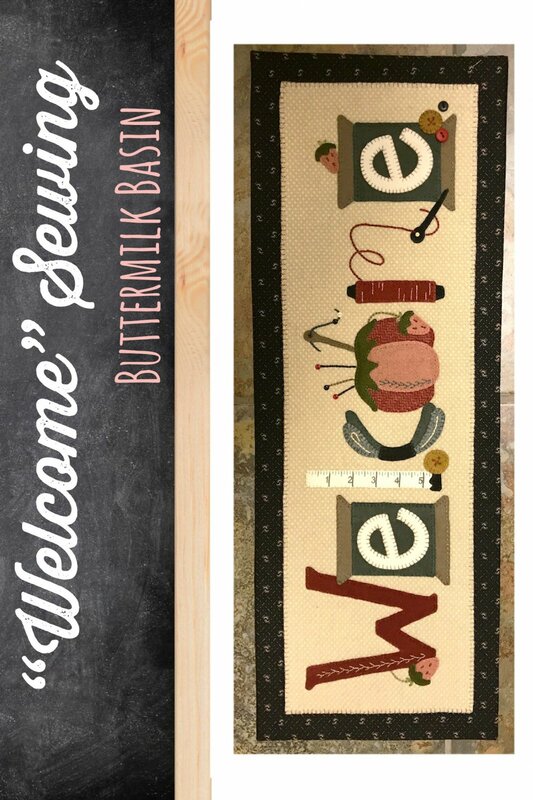 This fun Welcome mat for March has a sewing themed, perfect for your sewing room, and anywhere in your home! The wool applique on fabric mat is 9.5 x 26.5 inches when finished. The kit includes the pattern, wool and fabric. 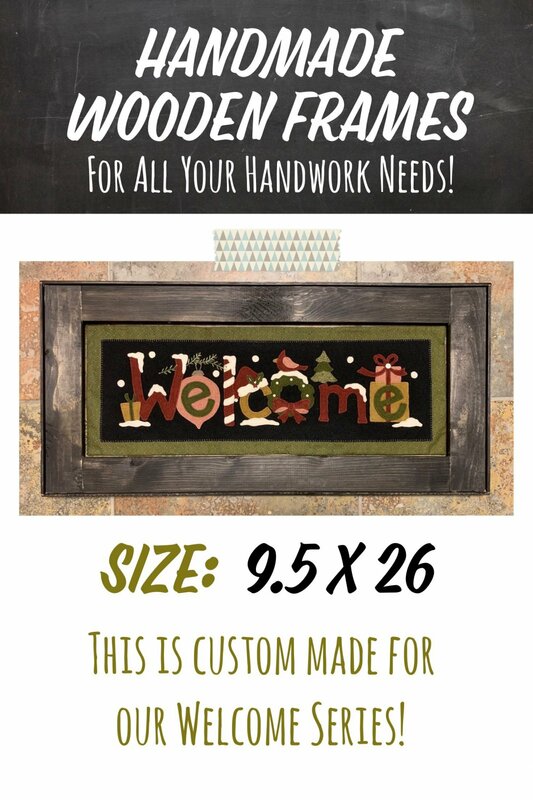 This fun Welcome mat has a sewing themed, perfect for your sewing room, and anywhere in your home! The wool applique on fabric mat is 9.5 x 26.5 inches when finished. 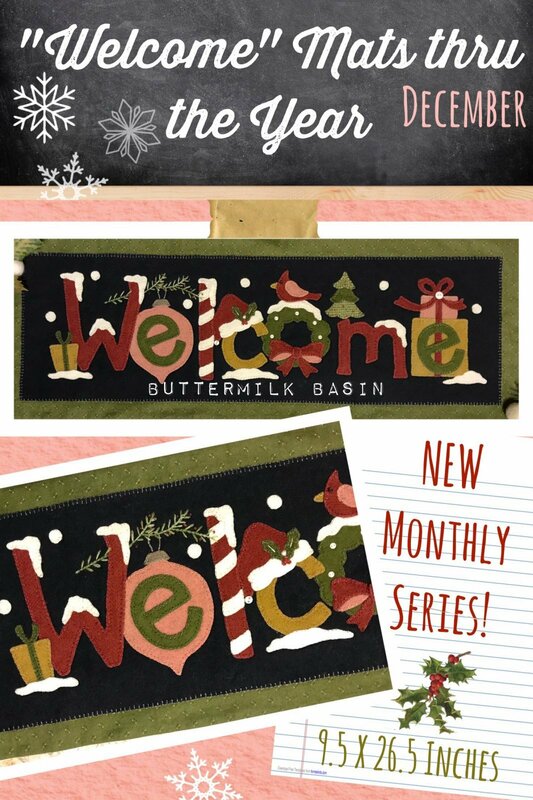 Introducing Buttermilk Basin's new series - "Welcome" Mats thru the Year! We begin with December's mat, which spells out welcome in all things holiday - candy cane, wreath, presents, and more! Pattern only. This button pack contains the hand dyed buttons that are used on the December "Welcome" Mat thru the Year.